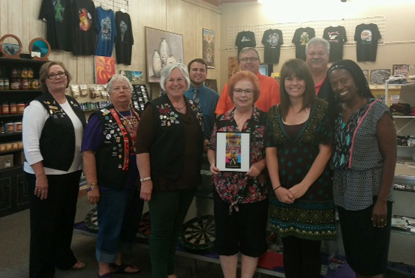 Members of the Artesia Chamber of Commerce and Artesia Trailblazers stand with Gayla Ivy, center, owner of B&B Newsstand, after naming B&B the Business of the Month for July. Pictured are, from left, Liz Williams, Roberta McCaw, Susie McCaw, Zac Gomez, Ivy, David Grousnick, Kelcey McCaleb, Perry Troublefield and Clara Mauritsen. B&B celebrated its 45th anniversary in July. The local newsstand remains a throwback to simpler times, serving as the hub of downtown activity since 1970. Loyal customers and newcomers alike enjoy partaking in the local gossip over a cup of coffee or a soft drink, as well as the friendly, accommodating customer service.